During the bright phases of the binary orbit, which lasts approximately 65 ksec, the source was observed to have a relatively stable spectrum. We therefore only need to simulate a single spectrum. Similar procedures, however, could be followed for simulating the X-ray faint phases of the binary orbit. XMM-Newton observations show that the unabsorbed luminosity, presuming a distance of 15 kpc, is 4x10^37 ergs/s, yielding an unabsorbed flux of 1.5e-9 ergs/cm^2/s. This is sufficiently bright that the question of photon pile-up must be considered; however, observations also show the NH=7.5x10^22 atoms/cm^2. 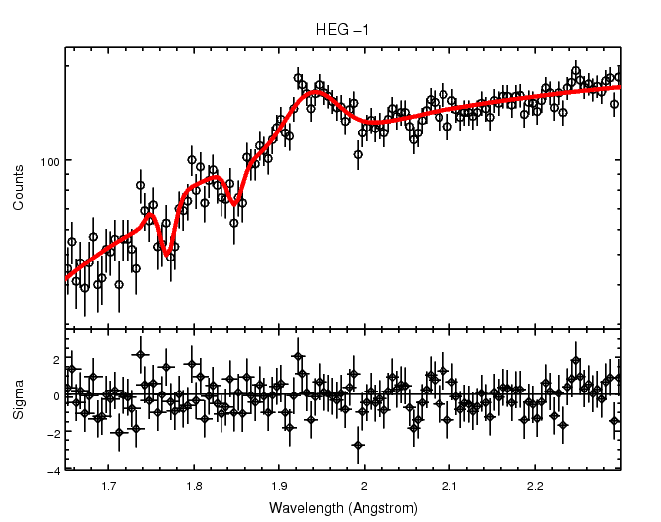 This high column, coupled with the high energy features, implies that the High Energy Gratings (HEG - covering 0.7-8 keV) will be the prime Chandra instrument, although the Medium Energy Gratings (MEG - covering 0.4-7 keV) will be important for studies of the absorption column, and may even directly measure absorption edges (e.g., Si at 6.67 Angstrom, S at 5 Angstrom). This thread uses a Sherpa simulation. It you prefer to work with ISIS please refer to the companion ISIS thread. You need to have Sherpa installed. Sherpa, the CIAO plotting and fitting application, comes bundled with the CIAO software package; it may also be downloaded independently from CIAO as a standalone application (click here for details). This thread is saved as a Python script which a user can simply edit and customize, and rerun for their own source. Download the latest instrument responses. This thread uses Cycle 13 responses and CIAO4.4 for illustration purposes: there might be some minor numerical differences when using the latest responses and some slight cosmetic differences in the Sherpa prompts. Note: before running it, the script needs to be edited so that the proper responses are used. For example the command hma = unpack_arf("aciss_heg-1_cy13.garf") will become hma = unpack_arf("aciss_heg-1_cy16.garf") when using cycle 15 responses. As a reminder pre-made responses are provided for proposal purposes only and THEY SHOULD NOT BE USED FOR DATA ANALYSIS. Check for other bright sources in the field of view. The Observation Visualizer, ObsVis, available as part of CIAO, is used for this task. For further information, please refer to the the "Proposing to Observe an On-Axis Point Source with ACIS " thread. Note, however, that due to photon order sorting - i.e., the concept that for a dispersed gratings spectrum a specific location along the dispersion arms must correspond to a narrow range of energies in order to be associated with the spectrum from a known source location - gratings observations (especially of bright point sources) can be fairly tolerant of background and other sources within the field of view. Complicated regions with many sources, might require the use of MARX simulations (http://space.mit.edu/ASC/MARX/). Sherpa includes the "additive" and "multiplicative" models of XSpec version 12.6.01. The XSpec model names have the prefix "xs", e.g. XSpec phabs model is called "xsphabs." 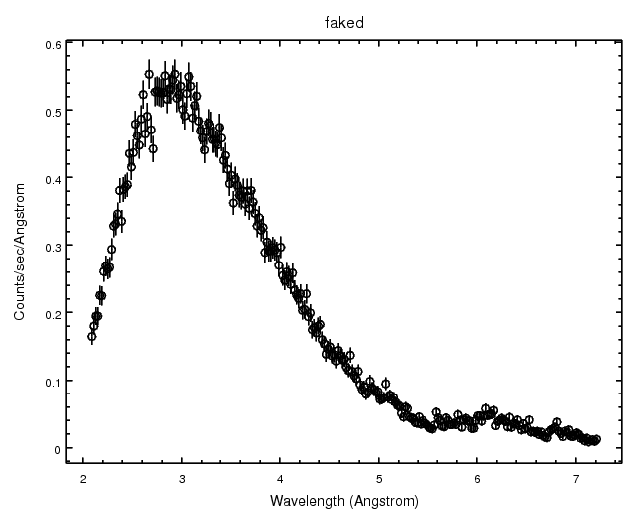 In this thread, we will only use standard XSPEC spectral models. Load the ARFs and RMFs and assign them to variables using the Sherpa "unpack_arf" and "unpack_rmf" commands. Having defined a model (which, by default, is the same for all four gratings arms) and instrument response, we now create a fake dataset (complete with Poisson noise) with the Sherpa "fake_pha" command. The exposure time for the faked data files is set via the 'exposure' argument. We choose to set the exposure times for the faked datasets to 650 ksec - a factor of 10 higher integration time than desired, at first, so that we have sufficiently good statistics to verify our settings of the model normalizations. The "fake_pha" command should be followed by "show_data" or "show_all" to verify that the datasets have indeed been created. 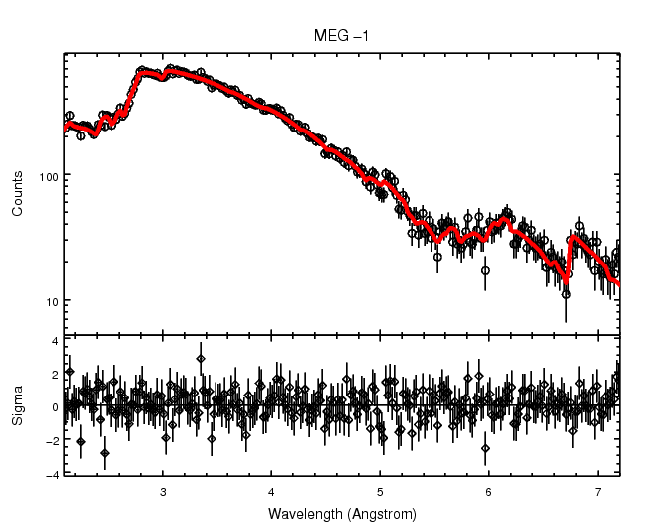 The HEG detectors (datasets 1 and 2) have less effective area, and hence fewer counts, than the MEG detectors (datasets 3 and 4), as shown by the output of the Sherpa "calc_data_sum" command. To set the normalizations, we use the "calc_energy_flux" and "calc_photon_flux" commands to define variables "pflux" and "eflux", that will return the flux in units of ergs and photons per cm2/sec. We also use the "eqwidth" function to returns line equivalent widths (for a given detector and model component normalization) in units of Angstroms and keV, which we convert to mAngstrom and eV. We see that the unabsorbed flux is very close to the quoted value, therefore we do not alter the normalizations of the continuum components. The line equivalent widths, however, are all too small. The three features should have equivalent widths of 95 eV, -14 eV, and -23 eV (from low to high energy). We therefore scale the line normalizations by the ratio of desired to measured equivalent widths, run fake_pha again, and then verify that the new equivalent widths are those that we desire. Finally, we set the neutral column to the value actually measured by XMM-Newton, we reduce the exposure time to 65 ksec, and we run fake_pha once more. Furthermore, we save the final model parameters to variable "lmxb_pars" using the imported "save_pars" function, in order to restore the settings later in the session. 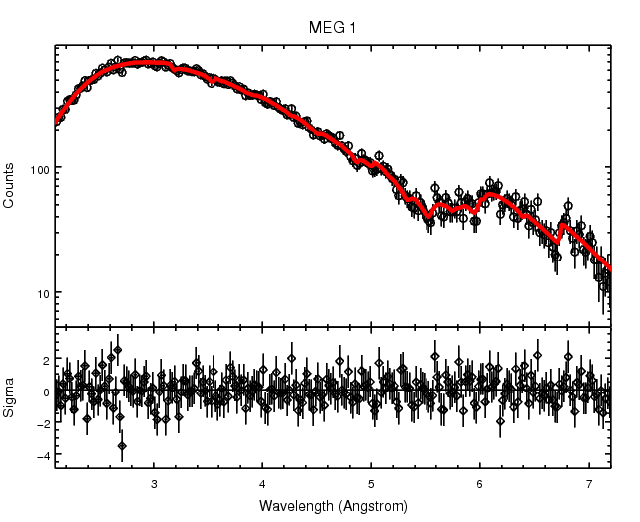 To increase the signal-to-noise, we group the HEG data sets by a factor of 2 and the MEG data by a factor of 4 (i.e., to about twice and one times, respectively, the intrinsic resolution of the gratings detectors). 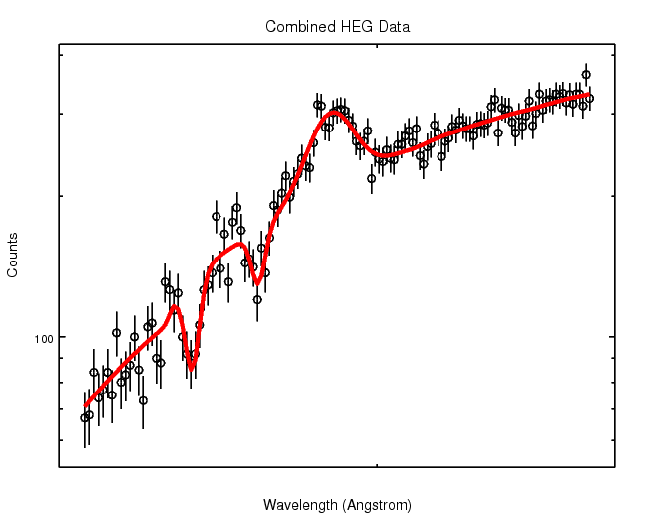 Additionally, for fitting purposes, we will combine the two HEG datasets, and we will combine the two MEG datasets. The resulting plots are seen here (Figure 1), here (Figure 2), and here (Figure 3). The "print_window" command is used to save the current plot to a color PostScript file, e.g., to generate a hardcopy of the plot. We now turn to determining the confidence bounds for the line parameters found above. For this, we use the Sherpa "conf" command, specifying 90% confidence limits (default is 68%). The conf command will return the upper and lower parameter values for these confidence intervals. We find that the line positions and widths are all determined with 90% confidence level uncertainties of approximately 0.01 keV ; in terms of velocities, this corresponds to approximately 500 km/sec. Note that for one of the error bars searches, the fit failed, so we switched to a different (slower) fit method, and searched for the error bar again. To facilitate the fitting process, we load the saved simulation parameters (which includes the lines), evaluate the model once (without fitting), and then rewrite the model without the line parameters. In this manner, we restore the unfrozen, starting fit values for the neutral column, blackbody, and power-law. With these fits, we find that the neutral column is found to be 7.84(+1.22)(-1.05)x10^22 cm^-2. There are fair number of counts shortward of the Si edge; therefore, a proposer could additionally explore what kinds of limits can be set on higher energy lines (e.g., Sulfur lines, using the MEG and HEG data). Roughly speaking, the peak pile-up fraction (which translates to the fraction by which the observed count rate will be reduced in the observed spectrum) goes as the peak counts per 3 pixel region (along the gratings arm) per frame readout time. This can be determined graphically using a combination of Sherpa plot and Python Numpy functions (note the availability of the Sherpa "jdpileup" model for non-grating data). 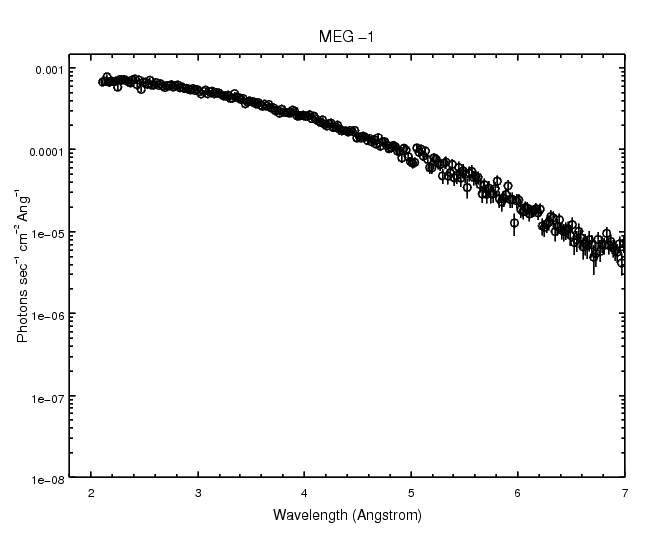 The simulations indicate that the MEG+1 detector (dataset 4) has the highest count rate of the two MEG detectors; therefore, we assess the pile-up first for that detector as a "worst case" scenario. We use the Sherpa "plot_data" command to view the data plotted as counts/sec/Angstrom, in linear x- and y-scale. We access the x and y data arrays defining the plot with the "get_data_plot" command, and determine the wavelength and y-value corresponding to the peak of the plot using simple Python functions. We then multiply the y-value by a typical frame time (3.2 sec), 3 pixels (events are read in 3X3 pixel detector cells), and 0.011 (the number of Angstroms per MEG pixel), to arrive at an estimate of the peak pile-up fraction. 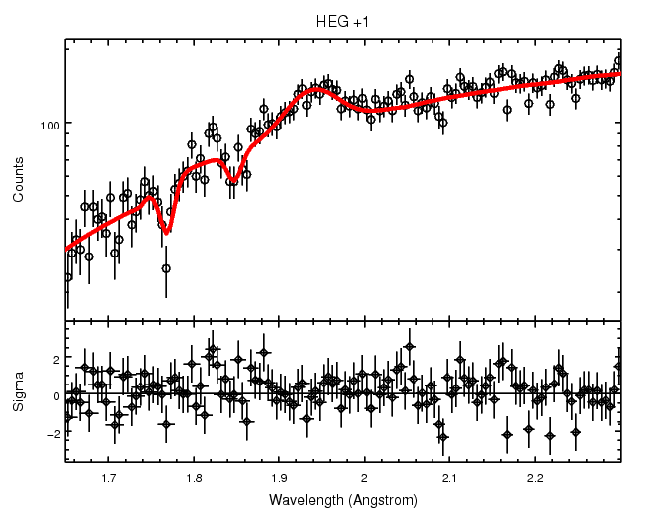 For this observation, we will use the HETG detector with the ACIS-S chips. To minimize pile-up, we will use only 1/2 of the array. The 1st order count rate can be found by summing the counts from the simulations (use the "calc_data_sum" command, as shown above) and dividing by 65 ksec. This yields 4.2 counts/sec. For the total field rate, we note that approximately an additional 20% count rate will appear in the higher orders, and for a source dominated by counts > 2 keV, the 0th order count rate will be approximately the same as the total first order rate. (The 0th order image will suffer severely from pile-up, hence reducing the detected rate. Calculation of that effect is beyond the scope of this thread. By ignoring pile-up in the 0th order image, we obtain a "worst case" estimate of the count rate. For successful proposals, the Chandra gratings contact scientists will work with the proposer to optimize settings to minimize the count rate in the 0th order image.) Thus, as a very conservative estimate, we use a total field rate of 10 counts/sec. The script can be edited to change the values of the parameters, as well as the file format of saved plots. For further information about installing and running Sherpa, see the Sherpa webpage on the CIAO website. This thread shows how to simulate a simple gratings spectrum of an X-ray binary, wherein the spectrum shows narrow Fe emission and absorption lines at energies > 6 keV. Furthermore, it shows how to estimate the constraints that the MEG place upon measurements of the neutral column. Simulating a 65 ksec spectrum, we found that HEG constrains the line positions and widths to within approximately 500 km/sec. The neutral column is constrained to within 20%. We looked at the estimated level of pile-up in the dispersed spectrum, and concluded that with a 1/2 sub-array, the peak pile-up fraction will be less than 4%. Accordingly, we choose a custom 1/2 sub-array to perform the 65 ksec observation.